This lavandin cultivar has a good growth habit and abundant flowers and looks nice when mixed with dark flowered cultivars. The spikes are narrow and light in color, so are not so useful for fresh or dried flowers. 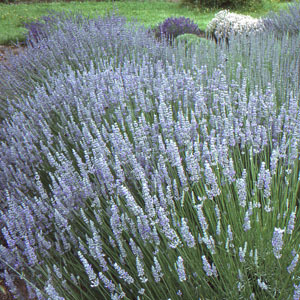 An excellent plant for making lavender wands. The calyx color is violet green; the corolla is violet. Categories: All Items, all potted plants, butterfly nectar plants, culinary herbs, deer resistant, lavender plants, Potted Plants, More..